John Paul II could be declared a saint this year after a Vatican committee approved a second miracle attributed to the Polish pope's intercession. The Congregation for the Causes of Saints ruled an "inexplicable recovery" on 1 May 2011 was due to the late Pope's intercession, Ansa reported. 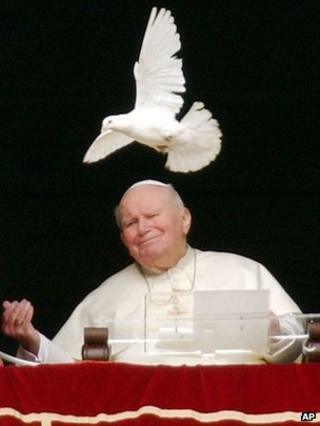 John Paul II could be canonised at the same time as John XXIII, Vatican sources suggested. Venerated by Catholics as "the good pope", John XXIII was elected in 1958 and convened the Second Vatican Council in 1962, but died the following year before it was finished. The Vatican has not revealed details about the second miracle in John Paul II's case. It was reportedly deemed an "inexplicable recovery" by a panel of doctors before being approved last month by a board of the Congregation for the Causes of Saints' theologians. Among a crowd hundreds of thousands strong on St Peter's Square was French nun Marie Simon-Pierre, who says she was cured of Parkinson's Disease after praying for the intervention of the late pope little more than a month after he died. Some questioned the Church's speed in beatifying John Paul II just six years after his death. Critics say other of the Church's deep-seated problems - such as its dysfunctional management and financial scandals at the Vatican bank - stem from shortcomings of his pontificate. John Paul II reformed the sainthood process in 1983, making it faster, simpler, and cheaper. The office of "Devil's advocate" - an official whose job was to try to knock down the case for sainthood - was eliminated, and the required number of miracles was dropped.